Walking the streets of Multnomah Village is like traveling back to a simpler time where main streets were places for communities to come together. This perfectly preserved business district maintains the character and charm it had 100 years ago with all the modern conveniences Portlanders need today. A true 20-minute neighborhood, businesses in Multnomah Village offer everything from books to clothing, toys to a diverse array of food and drink options all within an easily walkable core. Visit any time of the year and you are guaranteed to be greeted with friendly faces and festive seasonal fun. Venture Portland sat down with leaders of the Multnomah Village Business Association (MVBA) to talk about what they love about the district and why they are proud to call Multnomah Village home. 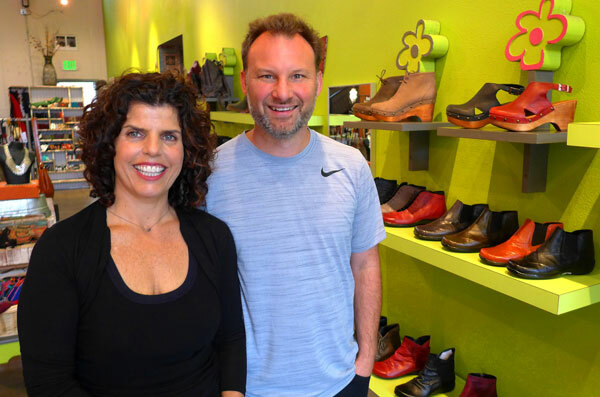 Jason Lensch and Jennifer Robinson are the Co-presidents of MVBA and Co-owners with Moshe and Rina Menashe of Switch Shoes and Clothing, a shop that carries a wide variety of shoes, clothing and accessories. Jason and Jennifer are also committed to community; partnering with local non-profits and schools for fundraising events. Randy Bonella is Executive Director of the MVBA and the Multnomah Village Bloc’s Initiative, an organization dedicated to improving safety and accessibility in the Village. What is your favorite thing about Multnomah Village? Jason: One of the things that I love about the Village is that it is a microcosm of everything great, cool and unique about Portland. There’s a diverse mix of businesses; everything from clothing to toy stores and a wide variety of food from different cultures like Down to Earth Café, Medley Tea and Thai Herbs. It’s pretty much all locally owned businesses where the owners are in the shops the majority of the time. Everyone is very vested in the community. We see our customers not only at the stores, but at schools and sporting events. When Switch Shoes and Clothing opened, we wanted the shop to be a community center and an extension of our own homes. It’s a place for our customers to relax and have a really comfortable experience with great customer service and care. Randy: From my perspective it would be the history. The district is 105 years old and a good number of the buildings in the core are still some of the original buildings that were built at the turn of the century. I think that is a huge draw for people. Some businesses like Annie Bloom’s Books have been here for 30-40 years. Along with that we have the Multnomah Historical Association which provides historical information, much of it relating to businesses in the district. Jennifer: It’s one of the business districts in Portland that still feels like ‘Old Portland’. Multnomah Antiques opened in 1975 and is a group shop encompassing 14 antiques dealers with over 250 years of combined knowledge. Annie Bloom’s Books first opened in 1978 and often hosts author readings and signings. Catch ‘Wild’ author Cheryl Strayed at Annie Bloom’s on December 9. The Multnomah Historical Association was founded in 1979 with a mission to preserve the buildings, history, stories, photos and memorabilia of the Village. Thinker Toys opened in 1994 and was named ‘Portland’s Best Toy Store’ by parentsconnect.com. How has Multnomah Village’s identity changed over time? Randy: It’s gone through multiple changes. In the early 1900’s it was a commerce hub with fix-it places, drug stores, grocery stores, meat markets, a movie theater – it was a self-contained town. 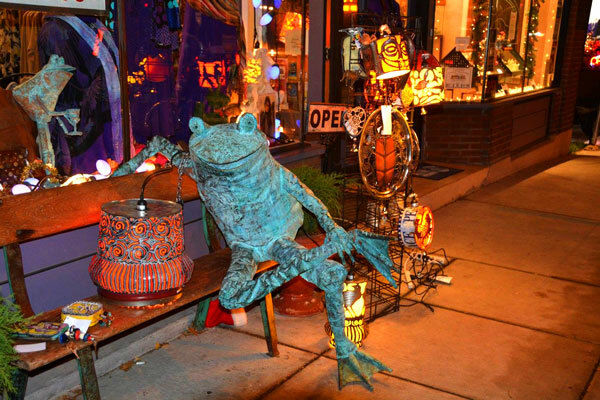 It flourished until the 70’s and many of the businesses left and the business mix shifted to primarily antiques. Since then it’s now cycling back to a true ’20-minute neighborhood’. Multnomah Village was mostly rural until the 1910s when the business district began to develop around the Oregon Electric Railway depot. Many of the original buildings remain including the 1913 Multnomah School which now houses the Multnomah Arts Center, a provider of affordable arts education to students of all ages, Multnomah Village’s first post office which is now Marco’s Café & Espresso Bar, a Multnomah Village institution since 1983, a 1914 bungalow that houses Jaqueline’s Found and Fabulous, a shop with distinctive home décor and extensive gardens and a 1925 Masonic Lodge which is now the Lucky Labrador Public House, a pooch themed brewpub offering 40 different varieties of beer. In which ways has Multnomah Village stayed the same? Jason: The community is still the core. Randy: About 70% of the building owners live in Multnomah Village or Southwest Portland. About 30% of those storefronts are owned by the businesses themselves so they are vested in the look and feel of the Village. That’s been a large driver in preserving the character because people live and work here and they understand what draws people to the area. If you don’t live in the neighborhood, Multnomah Village is easily accessed by the 44 and 45 busses. Visit trimet.org for more information. For bicyclists, SW Multnomah Blvd has dedicated bike lanes and SW 35th Ave is a designated greenway. Parking is available on the street and at the Multnomah Arts Center. 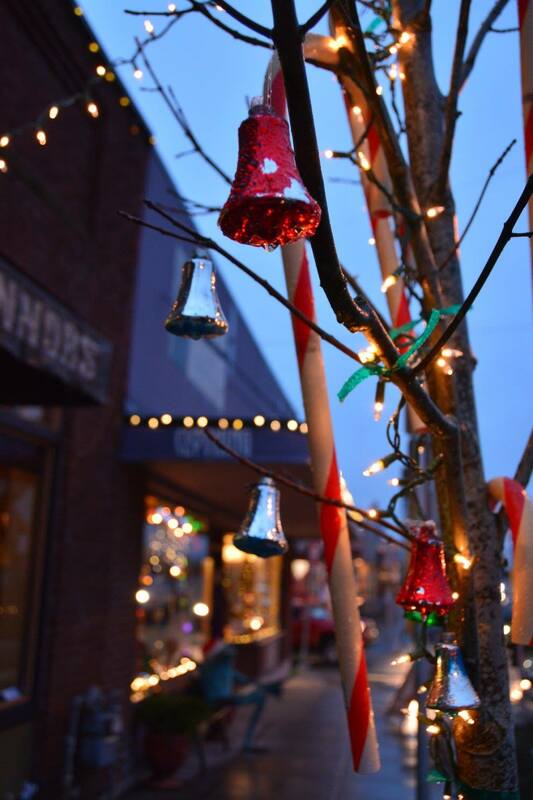 What is your favorite time of year in Multnomah Village? Randy: Between Thanksgiving and Christmas. The district conveys a small town vibe during that time because our Holiday Gala features horse-drawn carriages, carolers, Santa Claus, decorations – things that take us back to the time when we were growing up as children. There’s a vibe in the Village during that time that is quite different than anywhere else. Jason: I really enjoy Halloween in the Village. It’s great to see all the families together. I see a lot of familiar faces and I can really connect with them on that day. That brings me back to my childhood and seeing business owners dressed up like the kids is a real joyous time. At Thinker Toys, the whole staff dresses up. Riversgate Church does a walk-through Halloween kids zone with cotton candy and cider. The event is so popular that last year, Anastasia’s Salon had to use arrows to help direct the flow of foot traffic. Jennifer: The event ends at Multnomah Village Dental Care where they do themed dress-ups. Like last year the staff was dressed as gnomes. When businesses get together and have comradery it’s also good for the customers to see that. Parent’s love it too because it’s a safe way to trick or treat and it’s short and sweet. Multnomah Village’s Holiday Gala is December 4-5 and features Golden Ticket deals from local businesses, horse-drawn carriage rides, caroling and a tree lighting on Friday and breakfast with Santa and kid’s crafts on Sunday. Visit multnomahvillage.org for more information. Summer is also a great time to visit. 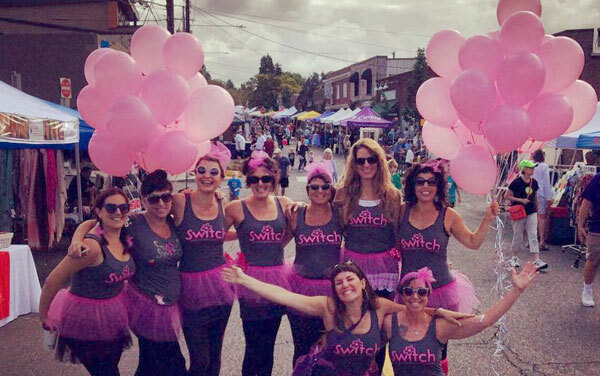 Multnomah Days features the Biggest Little Parade in Oregon and food and artisan vendors lining Capitol Highway and Vine and Dine is a great opportunity to sample wines from over 25 spectacular Northwest wineries and bites from artisan vendors. What would be the soundtrack for Multnomah Village? Randy: I’d probably say 1920’s or 1930’s jazz. Jason: I’d say something a bit more modern like Jack Johnson. O’Connor’s Café and Bar is housed in a 1924 building that was home to Multnomah Village’s first bank. The bar hosts live folk, rock and blues music every weekend in what was originally the bank’s vault. What would be your perfect day of food in Multnomah Village? Randy: For me it would be breakfast at Medley. They have some very unique breakfast items – it’s not just your normal pancakes, eggs, bacon. I’d have lunch at Down to Earth Cafe because I like Middle Eastern food and theirs is pretty dang good. For dinner, it depends on what I’m in the mood for. Today I’ll go with O’Connors for their spicy mac and cheese; it’s pretty unique. Jason: I’d have breakfast at Marco’s Café, lunch at Thai Herbs – their salad rolls are awesome – and for dinner I have to say Tastebud, which was ranked as one of ‘The Most-Anticipated Spots to Eat and Drink in Portland this Fall’. Medley Tea serves over 55 varieties of tea along with breakfast, lunch and an abundance of gluten free options. Down to Earth Café offers fresh vegetable juices, organic smoothies and Persian dinner menu items. Originally located in SE Portland, Tastebud re-opened in Multnomah Village in October 2015 and serves up wood fired pizzas, bread, lamb chops and poussins. What are some hidden gems in the district that most people might not know about? Jennifer: The Village Hut has an excellent cook and always uses fresh, organic ingredients. Jason: Healthy Pets Northwest is an awesome pet store. There’s such a great vibe in there and they are very supportive of everything we do in the Village. I also have to give a shout out to Umpqua Bank for the sheer amount of volunteer hours they contribute to the district. Randy: Riversgate Church bends over backwards for the community. Southwest Neighborhoods Inc represents 17 neighborhood associations and 3 business associations in Southwest Portland but their home is here in Multnomah Village so we really reap the benefits. Other hidden gems include The Craft Factory, a drop-in craft studio where visitors use recycled and repurposed objects to make unique pieces of art, Hattie’s Sweet Shop, a candy store that offers over 35 varieties of Licorice and 15 flavors of ice cream, Peachtree Gifts, which offers a selection of cards, wedding accessories, baby gifts, candles and more, Indigo Traders, which offers fine Mediterranean textiles and interiors from across the globe and Village Beads which has a large selection of unique pearls, crystals, glass, stone, shells plus jewelry making classes. Randy, as a longtime staffer of MVBA, what is your favorite Multnomah Village accomplishment? Randy: The Golden Ticket Shop Local Program. It was conceived at the Oregon Main Streets conference, morphing different ideas and programs together that other districts have done. The first year we had about 8,000 tickets in circulation and this next year we expect about 35,000 tickets in circulation. We get about 25% return on those which is about 10 times what the average is for coupons. It’s popular with the businesses because it’s easy and it’s popular with the customers because it’s like a game where people can optimize their purchasing power across both Hillsdale and Multnomah Village. Jennifer: People start asking about Golden Ticket November 1st. It’s a tool that helps people shop locally and it keeps the customers in the community. Golden Ticket runs 11/16-12/31. Shop at more than 50 participating business in Multnomah Village and Hillsdale and receive a Golden Ticket valid for a discount at any other participating business. 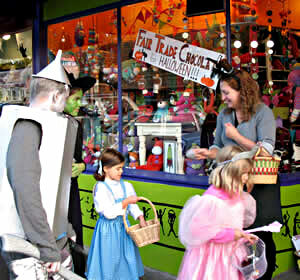 Visit multnomahvillage.org for the complete list of participating businesses. Jason and Jennifer, as current MVBA Co-presidents, what future plans for the district are you most excited about? Jennifer: We’re excited to keep growing our First Fridays. We really focus on the businesses for First Friday. It’s all about giving back to the community so the businesses have promotions, specials, food, music and a fun atmosphere to shop in rather than focus on just art. One business had a masseuse come in, Northwest Wools had flamenco dancing and O’Connors had the Spilt Milk comedy show which was really great. Jason: It’s exciting to get other businesses involved and get their creative ideas into the mix to see how we can improve existing events and incorporate new things. For example, last year Northwest Wools participated in a city wide Yarn Crawl where 15 or 16 knitting shops in Portland were involved. Lots of people came to the Village from out of town for the event so it benefitted the whole community. Jennifer: Another example is Little Boxes. Will and Betsy have really made the city of Portland feel like a small town. Sometimes Southwest Portland gets overlooked so the fact that we can be represented alongside all the other neighborhoods really brings it all together. Look for us on the Little Boxes map! Shop Little Boxes on Black Friday and Small Business Saturday for great deals and discounts city wide plus a chance to win raffle prizes. Download the app for Android or iPhone or print out business district maps and find out which businesses are participating in your favorite neighborhoods. Follow Multnomah Village Business Association on Facebook and keep up with the latest happenings in the district.